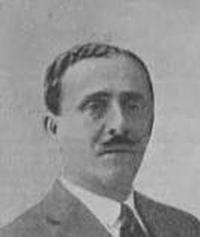 Count Giovanni Agusta (1879 – 1927) came from family of Sicilian origin. He was born on October 4, 1879 at Parma, Italy. He formed the Agusta company in 1923 which became part of AgustaWestland. The MV Agusta motorcycle manufacturer began as an offshoot of the Agusta aviation company at the end of the Second World War as a means to save the jobs of employees of the Agusta firm. In 1907, Agusta designed and built a biplane called the Ag1, and in 1912 he volunteered for the Italian-Turkish War in Libya; in 1913 he was hired by Caproni as an inspector in charge of delivering bombers to the front. He died on November 27, 1927 at Parma, Italy. His son, Count Domenico Agusta, followed in the family business, AgustaWestland.